All technicians have classes and training through ATRA – Automatic Transmission Rebuilders Association and ATSG – Automatic Transmission Service Group. At Cottman we back up our work with a 100% guarantee. We treat your car like it was our own. We take pride in correctly diagnosing the issue with your vehicle and doing so at reasonable prices. The term “4×4” generally means four wheel drive. It’s based on the idea that the vehicle has four wheels and all four can provide power to drive the vehicle. 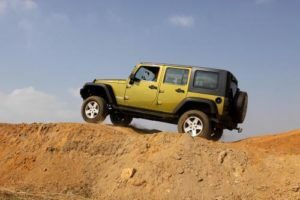 What sets 4×4 systems apart from all wheel drive is that 4×4 systems are selectable; that is, you can choose whether to operate them in two wheel drive or four wheel drive. Generally the transmission is the same on 4×4 and regular two wheel drive systems. The power is split behind the transmission using a transfer case. The transfer case then sends power to two separate differentials: one in the back and one in the front. Of course, that doesn’t mean there aren’t some important differences between 4×4 transmissions and regular rear wheel drive transmissions. For one thing, capacity: a 4×4 transmission needs to be able to handle a lot more load than many two wheel drive transmissions. Another is that, because these transmissions have a transfer case built into the drivetrain, diagnosis can be a lot more complex. Very often the transfer case can mimic transmission problems, which can lead to unnecessary repairs if you don’t know what to look for. That’s why you should bring your 4×4 to your local Cottman center in Columbia, SC when you’re having a drivetrain problem. Our technicians are very familiar with every 4×4 system on the road today. They know how to analyze their behavior, and they can isolate problems in the transmission and transfer case. So, when you bring your 4×4 to your local Columbia, SC Cottman center, you can be sure you’ll never pay for transmission repair unless you really need your transmission repaired. And that’s a common situation, because most cars and trucks that come into a Columbia, SC Cottman center with a “transmission” problem don’t actually need a transmission repair. That’s okay, too, because your technicians at your nearby Cottman center are only too happy to get you back on the road… no matter what was causing the problem. So, if your 4×4 seems to be behaving badly, get it over to your nearby Cottman center in Columbia, SC. They’ll do whatever’s necessary to get you back on the road, fast!